The PRZ (Pastoral Religious Zone). Though the conversation in #1 takes place in the Hard-Boiled Enclave of Dingburg, it evokes the PRZ of southeastern Pennsylvania, especially the territory between Parody and Pastiche, two rural villages in Yorlancberhigh County in southeastern Pennsylvania, in the Pastoral Religious Zone of the state – Parody named after the second member of the saintly missionary couple Weevil & Parodias, the founders of the Byzantine Mennonite Church in North Amerca; and Pastiche the site of the meeting-house holding the One True Colander, the most sacred relic of the Evangelical Pastafarian Church in America. I begin the new year of ties with perhaps the strangest tie I own, or maybe the most disconcerting. 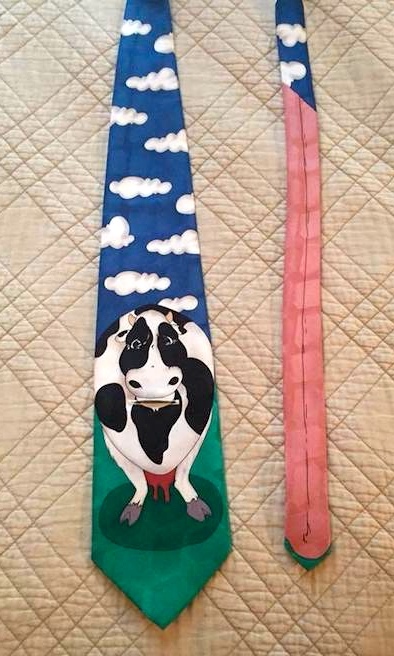 A while back Arnold Zwicky asked me what I felt my most unusual tie was, and I responded with a few that would be in the running. But I did not yet own this one which arrived in a lot of various interesting ties and which would have won that honor. 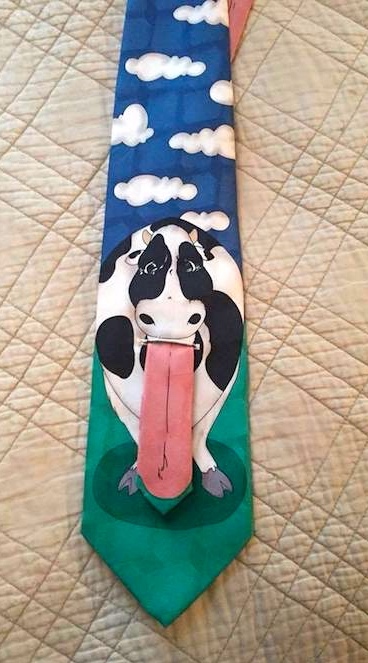 At first I thought it was just a novelty cow tie, but I wasn’t sure what the black line down the small end of the tie was meant to represent and the front of the tie had an explicable horizontal buttonhole. And then it hit me. It’s really more disconcerting in 3-d, when the cow tongue sticks out and flaps a little. The Big Sleep: The air was thick, wet, steamy and larded with the cloying smell of tropical orchids in bloom. The Long Goodbye: His apartment was small and stuffy and impersonal. He might have moved in that afternoon. Farewell, My Lovely: Even on Central Avenue, not the quietest dressed street in the world, he looked about as inconspicuous as a tarantula on a slice of angel food. Farewell, My Lovely: I needed a drink, I needed a lot of life insurance, I needed a vacation, I needed a home in the country. What I had was a coat, a hat and a gun. I put them on and went out of the room. short story “Red Wind”: There was a desert wind blowing that night. It was one of those hot dry Santa Anas that come down through the mountain passes and curl your hair and make your nerves jump and your skin itch. On nights like that every booze party ends in a fight. Meek little wives feel the edge of the carving knife and study their husbands’ necks. The fragrance of chypre came with him. [about the character Rocky Rococo] I didn’t hear him enter, but my nostrils flared at the scent of his perfume: Pyramid Patchouli. and of Telly Savalas as (tv) detective Kojak, sucking a lollipop. Mixed in there are purely Zippyesque pop-cultural preoccupations: stores like Lady Foot Locker, the food products Cool Whip and Gatorade, clam juice, troll dolls, the cartoon character Elmer Fudd, the places Jersey City and Detroit. And possibly a snowclonic figure Where Xs Go To Die (where Xs = elephants, dreams, stars, ships, birds, pigeons, good girls, the dead, …). This entry was posted on January 2, 2018 at 8:36 am and is filed under Books, Clothing, Language and religion, Linguistics in the comics, Parody, Pop culture, Snowclones. You can follow any responses to this entry through the RSS 2.0 feed. You can leave a response, or trackback from your own site.